UIS Events: Speakers Series presents "Adam's Gift"
WHAT: The University of Illinois Springfield Engaged Citizenship Common Experience (ECCE) Speakers Series presents a discussion with Jimmy Creech. 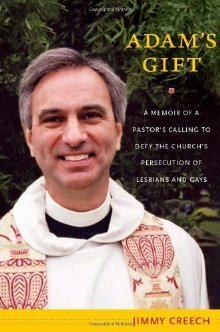 The event, entitled “Adam's Gift: A Memoir of a Pastor's Calling to Defy The Church's Persecution of Lesbians and Gays”, is part of Queertober LGBTQ Awareness Month at UIS. WHEN: Tuesday, Oct. 4, 2011 at 6 p.m. DETAILS: Jimmy Creech, a United Methodist pastor in North Carolina, was visited one morning in 1984 by Adam, a longtime parishioner whom he liked and respected. Adam said that he was gay, and that he was leaving The United Methodist Church, which had just pronounced that “self-avowed practicing homosexuals” could not be ordained. He would not be part of a community that excluded him. Creech found himself instinctively supporting Adam, telling him that he was sure that God loved and accepted him as he was. Adam’s Gift is Creech’s inspiring first-person account of how that conversation transformed his life and ministry. The event includes a question/answer session discussion, opening remarks from Chancellor Susan Koch, book signing and catered reception. Students must attend the presentation and discussion to receive credit for this event. This event is co-sponsored by the UIS LGBTQA Resource Office, UIS Office of Undergraduate Education, Student Government Association, and Diversity Center. For a list of other Speakers Series events, visit http://illinois.edu/goto/speakerseries. For a list of other Queertober events, visit www.uis.edu/lgbtq.